"It was not the PKK that did this. The soldiers did it. And the next day they burnt down our shops". ~ Survivor of the Lice Massacre, 1993. In recent years the expulsion of officers suspected of Islamic activities has become a regular occurrence at YAS meetings. In addition to its regular meeting in August, YAS can also be convened at a time chosen by the chief of the Turkish General Staff (TGS), which has usually been in November or December. A total of 17 officers were expelled in August 2006 and another 35 in November 2006. In 2005 the totals for the two YAS meetings were 11 and four respectively. Since the early 1990s, identifying Islamist sympathizers in the armed forces has become one of the primary objectives of Turkish military intelligence. Although the expelled officers are usually accused of Islamist “activities,” suspected intent rather than action is usually sufficient to ensure their expulsion. The expelled officers are rarely allowed access to the evidence gathered against them and, under Article 125 of the Turkish Constitution; there is no right of appeal against YAS decisions. Expelled officers automatically lose all their pension rights and frequently have difficulty finding alternative employment. Until relatively recently, the TGS’s primary fear was infiltration by supporters of the Islamic preacher Fetullah Gulen, who is currently in exile in the United States. Gulen’s supporters in Turkey currently control a vast network of businesses, schools, charitable foundations, and media outlets. The movement was an outspoken supporter of the AK Party in the run up to the July 22 general election (Today’s Zaman, July 21). After a long period of time, TSK, in its Higher Military Council (YAŞ), did not expel any military member. 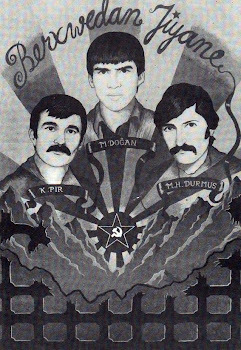 Prior to the YAŞ assembly, there were speculations that TSK would expel military members who were involved with Ergenekon. However, there were no files of any military members regarding expulsion. This is more evidence that the TSK is involved with a deal with AKP in order to cover up the identities of the true Deep Staters, while blaming Deep State crimes on those currently detained in the Ergenekon case, all of whom are retired and well-known embarassments to the Islamist regime in Ankara, and their lapdogs among the Turkish General Staff. Erdoğan, more than a month before the YAŞ meeting and a day before his contact with Gen. Başbuğ on June 24 -- when Başbuğ was the Turkish Land Forces commander -- also met with Gen. Işık Koşaner, when Koşaner was the chief of the Gendarmerie General Command, said informed sources. Ten of the 11 judges found the AKP guilty of the charge of being “a centre of anti-secular activity”, Mr Kilic said. But only six voted to close it, one short of the number required to ban the party. Instead, the AKP faces a big cut in its state funding, a penalty that will be compensated for easily by its wealthy backers. As for Başbuğ, no one should forget that he was one of the butchers of Lice in 1993. Hevallo has more on the Lice Massacre, including pictures, for those who are memory-challenged. Münir Erten, who confirmed PKK's casualties from the December 2007 aerial bombing campaign, has also been retired. Yaşar Büyükanıt, who was rescued from the Şemdinli incident by the AKP, has been awarded with a brand new car for his retirement. However, this disturbs CHP. In addition to the YAŞ decision without expulsion of religious officers, the purchase of an Audi A8, worth 1 million Euros, by AKP for Büyükanıt, raised several questions. CHP group parliamentary deputy Kemal Kılıçdaroğlu, referring to the Council decision without expulsion, and the purchase of a new car for Büyükanıt, mentioned that this incident raises suspicions of a deal between AKP and TSK. Right after CHP's suspicions [were made public], the General Staff released a severe statement. In the statement, it was mentioned that Büyükanıt survived four assassination attempts, thus it [the armored car] is a necessity. Turkish president Gül, who, according to the constitution, is supposed to be neutral, also supported this purchase and criticized CHP for its suspicions. In Necati Doğru's column in Vatan, he revealed the vehicle's picture, bill, the document for its export from Germany, the vehicle's price with and without armor, the document for entrance into Turkey, technical specifications, a document sent from the National Defense Ministry to the Customs Ministry to order the Customs Ministry not to charge duty on the import, and a document that shows the vehicle entered Turkey duty-free. According to Doğru's source in the National Defense Ministry (MSB), the car was imported from Germany for 1 billion YTL. It's an ice-silver metallic color, 4-door, gasoline-burning, 12 cylinder, 6,000 motor engine, 2008 Audi A8 W12 luxury automobile. The vehicle will be for retired Büyükanıt's personal use and TSK claims that any deal between AKP and TSK is mere fantasy. But the fantasy is unlikely. For example, the previous Chief of General Staff, Hilmi Özkök--widely believed to be Islamist--was so worried about assassination at the end of his tenure as TSK chief that he started bringing his own lunch from home in a lunch box. But there were no indications at the time of his retirement that he was going to get so much as an armored lunch box, much less an armored car for personal use. When he does retire, Büyükanıt will be able to drive his new armored Audi A8 W12 to his new villa, which is almost complete, in a village near Kuşadası. Since we're on the subject of armored cars, Turkey is also providing armor for five Toyota Landcruiser V8, four-wheel drive SUV's for the not-so-bright Georgian president Mikheil Saakashvili. Turkey is also armoring Saakashvili's official Mercedes. Gül repeatedly returned to the importance of Turkey's democratisation process. He said it would ultimately resolve all of the country's domestic problems, including the long-festering conflict with Kurdish nationalists in south-eastern provinces. "Some call it terror, some call it the south-east problem, some call it the Kurdish problem - whatever you call it, we will find a solution," he said. But we all saw very clearly what the AKP's "solution" for the Kurdish situation was, in September last year, when Gül made his first visit as president to TSK installations in The Southeast. We also saw clearly what AKP's "solution" was last December, February, and in March, during Newroz. As with Başbuğ's solution in Lice in 1993, so now AKP's solution is also the military solution. In any way, did you not sense a humanist strategy in AKP at least even more so than the parties before them? There were pro-EU and pro human rights, I believe most of the minority groups in Turkey were supporting their actions but I see you treat them as just another government. When their -kurdish- roots are already being questions and they are accused of basically selling the country by the entire pseudo-liberal crowd of Turkey. I mean the entire Ergenekon case was just the polar objectification of the popular discontent in Turkey for them. To see that even Kurds hate these AKP guys is interesting. The videos you send are rather sickening but you are making the mistake of confusing these people with the ruling party or the regime. Even Turks make this prime mistake of democracy. I don't believe these can be attributed to AKP. Mizgin I have to say this again that Before you post such videos here it is best if you give a warning of -graphic content- for those of us who might not be able to handle it. Who appointed the security officials in North Kurdistan? The Islamist regime in Ankara. They are responsible and everyone in North Kurdistan knows it. That's why they all yell, "Katil Erdogan" during demonstrations these days. And there's no way for a Turk to make any mistake regarding "democracy" because they don't have one. Never have. SA, if you think the video links in this post are bad, you need to see this one. I did not look at the video link you sent, thank you, like the plastic bullet video's sent from Israel, I believe they just and only show worst of humanity and that is all they show. "Islamist regime in Ankara" ?? What are you a pseudo-liberal istanbul Turk or something? Even those do not think of the current regime as islamist anymore. The new theory is that AKP is just here to weaken the prestige of the army with the help of israel and Usa. That "islamist conspiracy theory" is like, 3 years old. I used to think AKP was the first regime to try to end the conflict in south-east Turkey since Ozal in late 80's so I had a positive idea about AKP. I was thinking the minorities had a positive idea about them as well... now I see I was wrong. I guess absolutely everyone, from Ergenekon to the Kurds hates them. SA = Meursault = Turkish E.T. hahhaahaha, you turks are so stupid that you don't realise anything even things have already happend. Don't bloody just follow the AKP administration instead watch Atv, Ulke TV or read Sabah, Zaman, Aksam, Vakit, Milliyet, Cumhuriyet to see what is happining in Turkey. Because of the AKP Turkey in every way preperaing fast to became another Islamic State after Iran. Almost all of the people appointed by the Islamist Turkish President Gul either support the Sheria law or belong to one of islamist organisation. AKP has not passed a single islamic law in the past 7 years. I follow AKP administration, and the mass media isn't the place to follow what is happening in Turkey. As I said before you Turks are too dumb to understand what is going on around you and even I point the exactly the thing that you are looking for still you most Turks have no brain to understand. What about lifting the ban on head scarf in the universities (I know it was overturned by the contstitution court but even taken such a decision at the governmental level is a big step in Turkish politics) any how I wasn't talking about what AKP do directly but indirectly given a lot of influence to mass media in Turkey to prepare Turks for Islamic Republic as similar to Iran. According to recent polls conducted by the respectfull company revealed that at least 74% of Turks want to be rulled with Islamic Sharia laws. 15 TEBAX 2008 PÎROZ BE! "COLOSSAL DAMAGE TO THE ENTIRE REGION"